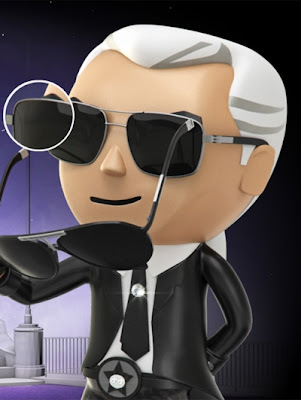 You probably all know who Karl Lagerfeld is, the guy with the sunglasses and the high collar. He's a fashion designer who likes to show the world his brilliant ideas. First he made his very simple but thought trough 'Karl Who?' bags and shirts. And again he found something simple that catches on easily. I'm talking about the Karl Lagerfeld video game. The task in the game is to take his sunglasses off. I already played it and it is really fun, it's vey funny!